Per Federal election rules, we’re required to collect your Name, Street Address and Employer (if you’re retired, enter Retired). Please print out and submit this form with your check. Below is what you will see after clicking the Donate button. 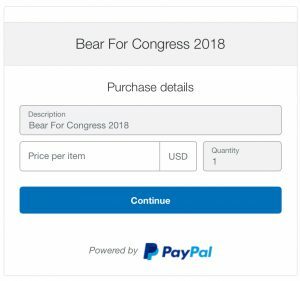 Enter your donation amount in the Price per item field. As an example, if you wish to donate twenty five dollars, enter 25.00. Make sure to print this form and include it with your donation. Copyright © 2019 Henry Bear for Congress. All Rights Reserved.